Since I last ‘mused’ on Mackintosh at the end of 2014 there has been quite a bit of good news to report. I think there is still an awful sense of shock and loss resulting from the fire at the School of Art last year but at least that disaster has galvanised action in other quarters. The exhibition at the Hunterian focussing on Mackintosh’s career as an architect transferred to the RIBA in London and attracted considerable, and much deserved, attention in the national press. The critics suddenly seem to have remembered that Mackintosh designed some superb buildings and not just the ‘Mockintosh’ tea-towels, mugs and pastiche jewellery which has flooded the market in the last twenty years and obscured Mackintosh’s real achievements. Let’s hope this revival ensures no further losses of his work. What?, you might be saying, surely that’s no longer possible, but the powers-that-be have allowed the removal of the wonderful organ he designed for Craigie Hall in Glasgow in order to facilitate the division of the house into several discrete units. It’s no real consolation that the organ is to be offered to Glasgow Museums – so, in 1973, were the interiors from Mackintosh’s Ingram Street Tea Rooms and we’re still waiting for their reinstatement somewhere. The Charles Rennie Mackintosh Society was quick to realise that what happened at the School of Art might not be a one-off event. With the backing of the Monument Trust it has instigated a physical survey of all surviving properties which will record the present condition of each and make recommendations for their future safeguarding. Such information only currently exists in a piecemeal form, if at all, and the completed survey, due next year should prove invaluable in ensuring the future survival of what remains of Mackintosh’s built achievements. The School of Art has been coming to terms with the likelihood of not returning to its core Mackintosh building until 2018. While its first priority has naturally been to ensure the viability of its teaching it is now turning its attention to the restoration of the building and the restitution of some of its displays of the very important Mackintosh collection that it has accumulated over the last 100 years. Some of that collection is to be on show in the new Steven Holl building on Renfrew Street and discussions and deliberations are continuing about the future of the main building. 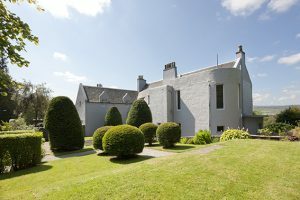 Better news – the National Trust for Scotland has raised £100,000 to retain two important pieces of furniture designed for The Hill House and previously on long-term loan to it. And, finally, for those of you desperate to acquire and live in your own Mackintosh house – Windyhill in Kilmacolm is on the market. You’ll need deep pockets.